MHP has a long history of listening to industry demands and meeting or exceeding expectations. MODERN HOME PRODUCTS (MHP) was founded in 1957 by Walter Koziol and was the first manufacturer in decorative gas lighting for residential applications. Gas lighting was marketed under the trade name Charmglow. The world’s first outdoor gas grill was invented by Walter marketed under the trade name of Perfect Host. 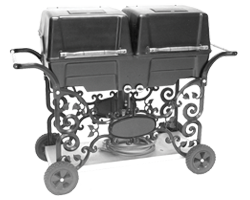 The Perfect Host was a 22 1/2″ round portable cart unit available in natural or LP gas and constructed of steel. The Perfect Host changed the way the world cooks-out and laid the foundation for the gas grill industry. Charmglow had become a household name, so MHP changed the company name to Charmglow Products. 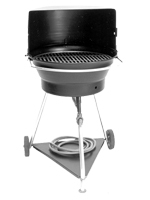 The first rectangular designed gas grill made out of steel with hinged lid was introduced. Further improving upon our design, the first rustproof cast aluminum rectangular gas grill with a patented hinged lid was introduced. To this day , this remains the industry’s most popular design. Pictured is one of the first solid rustproof cast aluminum grills made in 1964 and is still in use at a home in Antioch. 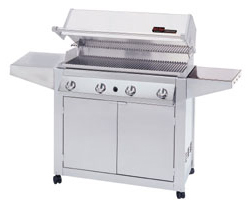 The Chef’s Choice series was the first double gas grill with a one piece bottom casting. It was also the first gas grill to receive an industry award for best design. The award winning design featured a 700 sq. in. cooking area and was mounted on a cast aluminum scroll cart. A line of gas fired Luau torches was introduced to further enhance the complete product line-up. The Charmglow name along with the grill and lighting products were sold to Beatrice Foods Company, however the assets of the company were retained. After the sale, the Koziol family reinstated the MHP company name and began development and engineering of after market gas grill replacement parts. 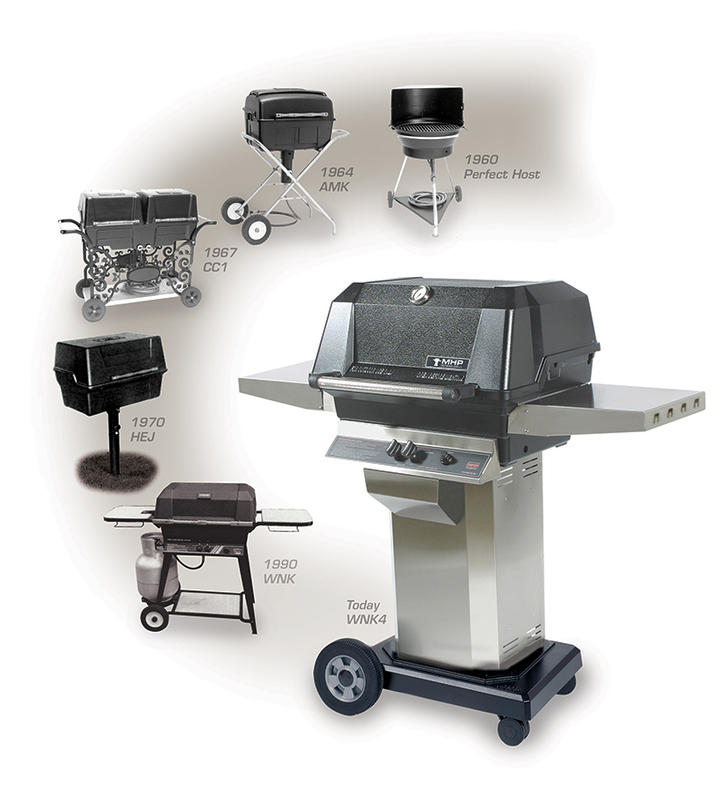 MHP became the first company to market a comprehensive array of patented universal and exact fit replacement parts for most brands of gas grills. Once the non-compete agreement with Beatrice Foods Company expired, MHP reintroduced a line of cast aluminum and solid brass gas lights. Responding to market demands for better quality and performance, MHP developed a new line of high-end gas grills based the award winning Charmglow designs. 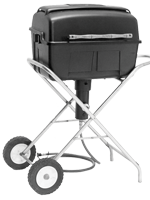 MHP Introduced the BBQ’er Choice grill series—a superior, high quality all cast aluminum grill available in both natural and LP gas. In addition, MHP introduced another first in innovation and design—the patented SearMagic reversible cooking grids. These grids, constructed of high-performance rustproof aluminum adding cooking and versatility, remain an integral part of current product line-up. The industry was changing and demanding larger stainless steel grills. MHP responded with the feature-packed GJK 36″ grill which boasts an impressive 906 Sq. In cooking area and 54,000 BTUs. As demand was increasing for backyard kitchens with impressive built-in designs, MHP released our first series of built-in grills and accessories. We continue to expand our outdoor kitchen product-line. Early in 2004 MHP turned its attention to developing the first cast aluminum infrared and hybrid grills. Four news models were released in the fall of 2015. MHP purchased ProFire Grills, which had been in business since 1990, allowing the expansion of the grill line to include high-end stainless steel portable and built-in gas grills. 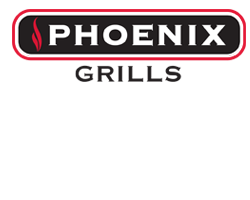 Once again, responding to industry demands, MHP designed and developed the New Phoenix Grill series–the grill that cooks it all! Bringing the great outdoor flavor indoors, the ProFire division introduced ProSear, the first and only all infrared stainless steel indoor gas grill. MHP is still a Koziol family owned and operated company. The most important elements contributing to the company’s long-term success is its ability to provide quality, innovation & reliability. Since it began marketing gas lighting in 1957, MHP has continually designed and manufactured superior products in the U.S. that are responsive to the industry’s changes and challenges. Consistent quality and performance…MHP’s time-tested formula for success.